Well... there is a practical solution to this common problem of where to put your purse or handbag. Just use a Handbag Hook! You will never have to put your purse or handbag on the floor or backs of chairs again! Simply slide this device over the table or counter’s edge, hang your purse, handbag or umbrella from the hook! Your purse is safe, protected, close at hand and in your sight! Currently there are 3 beautiful colours to choose from; Lavender Pink, Turquoise Blue and Sage Green with a silver tone floral design accented in the centre with a Rhinestone. Each piece comes with a black velvet pouch so it will not get scratched or scratch other things in your handbag when you’re not using it. 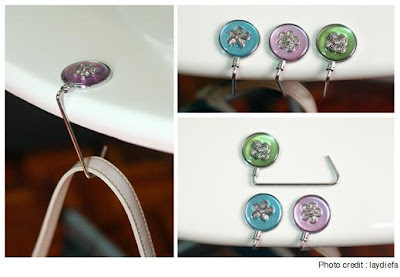 The Handbag Hook is priced at an affordable RM 20 each. Buy one or all three colours for yourself or present them as a gift for your loved ones. Interested? Simply follow the link under 'Items for Sale' on the right hand side of this page.